What Makes A Good Innerspring Mattress? Though innerspring mattresses account for about half of the mattress market, there are fewer quality options available because they are more difficult to manufacture and ship. Because of these constraints, very few of the online-only companies end up with an innerspring option. That will probably change over time, but it is just much easier logistically to have a foam mattress if you are selling online. Fortunately, the online-only companies that do choose innerspring tend to be more advanced in their mattress knowledge, and deliver a quality product (generally) at a really good value. You can really get a great product at a great price with these mattresses that should last a long time. These reviews cover my personal experience with a number of the leading innerspring brands. I plan on reviewing a lot more over time, including a lot of the ones that you can’t buy online. If you have any questions about the mattress, feel, or alternatives, please feel free to message me at [email protected] I’d love to hear from you. Winkbeds has a luxurious construction that features a coil-on-coil design that you normally only see in mattresses much more expensive. The mattress is well constructed is a little bit firmer than average. That makes it an ideal mattress for most people who sleep on their back or stomach. Aviya is another quality spring mattress that uses great materials but doesn’t charge a ton of money for its mattress. The targeted indentations give extra comfort to your shoulders, back, and legs. The result? A natural latex mattress that has the best pressure relief. Everyone is looking for something a little different with their innerspring mattresses, but I’ve chosen my four favorites across some general categories: overall, side-sleeper, budget, and high-end. These are not only some of my favorite innerspring mattresses, but they hold top spots in my overall mattress reviews list. WinkBeds is a relatively new company, but it comes with a great design and specs. This tops the comfort list because even the medium-firm option has an extra 2 inches of foam on top, making it a bit more cushiony than other options (and very pressure relieving). WinkBeds has a soft, medium, and firm option, so it can cater to all sleeping positions. The mattress is not as well known as Saatva, but it has a cult following that loves it. See more details about the mattress on their website. To learn more about my personal experience with WinkBeds check out my full WinkBeds review. Saatva is a quality online-only mattress that (in my opinion) offers great value (learn more HERE). The specs will compare to a higher-end Beautyrest, but the price tag is significantly less (Saatva tops the best mattress under $1000 list as well). The mattress has a layer of memory foam on top, and comes in three firmness settings. The company has been around for a number of years, and thus has many more reviews than the average online mattress company. Saatva is an innerspring mattress I often recommend, but see what type of sleeper I recommend it for most frequently in my Saatva mattress review. Aviya is a small company, but they have managed to deliver a solid innerspring option at a pretty phenomenal price. This is by far the lowest priced option on the list, though the dropoff from WinkBeds and Saatva is only a slight one. Good specs and good durability, but again the story with Aviya is it’s just a great value. 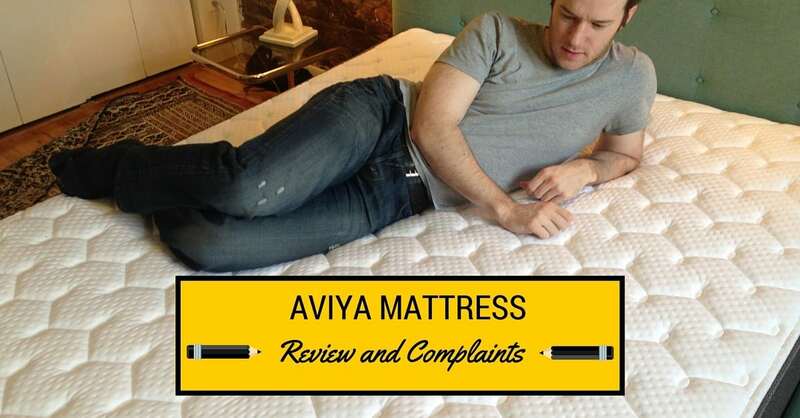 Read about my experience with the mattress in my full Aviya review. Brentwood Home has a number of different types of mattresses, but for me their innerspring mattress the Oceano really impresses me. Brentwood Home has a really quality brand and team, and even has their own factory located in Los Angeles. The mattress also has great specs, I predict the mattress will be very durable and last a long time. If you go with Brentwood Home, make sure to use my exclusive Brentwood Home coupon ($75 off). If you have back pain, you’re going to really want to focus on great support. All of these options can address the issue, and it might depend most on your sleeping position – but personally I would head for Saatva if I was having lower or mid back pain. If you are a stomach sleeper, you should go with a firmer mattress to get the right feel and support. Of these options, Saatva and Aviya offer firm options. You may consider some of the firmer Simmons Beautyrest options as well. Read our best mattresses for side sleepers options for other mattress types. If you are a side sleeper, you are going to want a slightly softer mattress to deal well with the pressure points on your hips and shoulders. I would start with WinkBeds, as I think that has a really nice feel when laying on one’s side. One big frustration with the mattress industry is how hard it is to objectively compare different models and brands. That is especially true with innerspring mattresses. For one, certain brands will be called different things at different stores, even if they are the exact same mattress. That alone creates a ton of confusion. 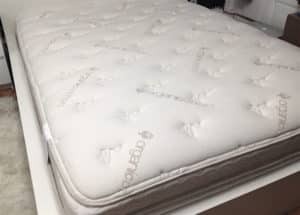 Similarly, even if you can compare across more objective measures, like coil count or gauge, there are many other factors that will affect the quality of the mattress. For example, there are plenty of mattresses with a higher coil count that are less quality than those with a lower coil count. As a result, you have to take these levels of comparison with a grain of salt. If you are in a store or on a website, you might see a lot of talk about how a certain innerspring mattress has a certain number of coils, a certain gauge (thickness of the steel wire), etc. These types of stats have the potential to be pretty misleading for a couple of reasons. For example, a lot of people think more coil equals a better quality mattress. However, you can have a higher coil count but use lower quality steel. There are many different factors that go into the quality of the innerspring unit. I would therefore recommend being a little cautious in thinking more coils equals a better mattress. An innerspring mattress can be made more or less firm in a number of different ways, and a lot of it depends on what the top layer above the coils is. Therefore, saying a blanket statement like “thicker gauge means firmer mattress” isn’t always true, because it depends on a few other factors too. You will also probably hear a lot about the type of coil being used in a mattress’s construction. There are differences between the types. “Pocket” coils are individually wrapped and tend to be better overall at contouring to your body, all things else being equal. However, the type of coil matters more or less depending on the rest of the components of the mattress, so I would take statements like “it has pocket coils, so it’s better” with a grain of salt. If you have a thick layer of memory foam on top of the mattress, the fact that the innerspring unit has pocket coils doesn’t really matter as much, because the memory foam does the contouring. Overall, the type of coil does matter, but its importance is dependent on the rest of the mattress. Not all innerspring mattresses are made equal, and a big reason why is the comfort layer used on top of the springs. There is a wide range that can be used to add comfort to the springs, and that makes the feel of the mattress different. For example, an innerspring with a thin layer of latex on top will feel much different from one with a very thick layer of memory foam. As a result, you need to understand the differences between the different types of comfort layers. Know the difference between poly foam, memory foam, and latex foam, and decide which feel you like better. Also, understand that the thickness of the comfort layer matters a lot too. If the mattress has a thick layer of memory foam, then it is more of a hybrid and will feel more like a memory foam mattress, which tends to be quite a different feel from the traditional feel associated with innerspring mattresses. I’m a big fan of getting the best value possible. If you are going to shop at a chain store, then I would wait until they have a sale to get the best value. Sales happen somewhat frequently and predictably, so just be on the lookout for them. You can also occasionally find a gem through local manufacturers, depending on where you live. Lastly, buying online represents a create value because you cut out the middleman of the business model. Currently, that way of doing business is generally filled more with “bed in a box” foam mattress providers, although I have reviewed two, Saatva and Winkbeds, which I like a lot and think provide a great value given their very reasonable price. Finding the best innerspring mattress can be tough, because there are so many different models and brands, and the characteristics that might make them good or bad are tough to understand and compare. As you narrow down your choices, read as many reviews as possible, because ultimately owner experiences will help you get a clearer idea of how good a mattress will end up being. Keep in mind, however, that just because some people like a mattress doesn’t mean you will definitely like it too. The important thing to know about a spring mattress is that a bad one is really bad. With a memory foam mattress, you can only do so much to mess up a piece of foam. But a bad innerspring mattress can wreak havoc on your back and sleep experience in general. However on the upside, I think that a quality innerspring mattress offers tremendous support, and is certainly preferred by many sleepers for its unique feel. Winkbeds should feel softer. The Cedar will have more bounce to it. Hi, do you have any experience with the Spink and Edgar mattresses? They felt extremely comfortable in a showroom, but they are very expensive. I’m not familiar with them unfortunately. There is no mention of Tempor-pedic mattresses. Why is that? They make mainly memory foam mattresses. Tummy sleeper. Like good support. Like plush/pillow top. What to do? Winkbeds is a good fit I believe. Would you recommend the Stearns and Fosters Estate Collection Ultra Firm mattress? I went to the store to check it out. I liked it. But online reviews are not good. Many complain that the mattress dampens with time, causing back pain and stuffs. I am a stomach sleeper and am looking for extra firm mattresses. The other option that I am considering is the Simmons Beautyrest Platinum mattress. Any suggestions/advice would help. 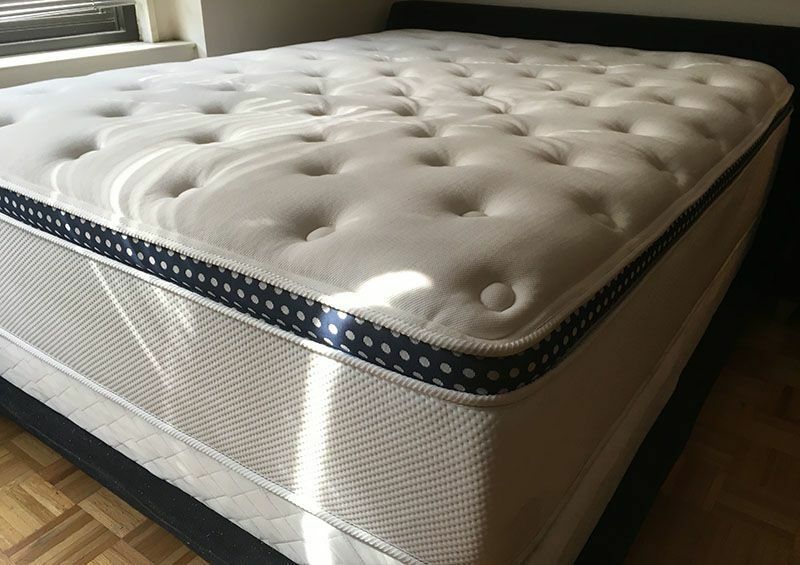 I don’t have any personal experience with either the Stearns and Fosters Estate Collection Ultra Firm mattress or the firmest version of the Simmons Beautyrest Platinum mattress, but since they’re both a mix of foam and coils I think they will probably be similar in terms of feel. Both brands have good reputations for using high-quality materials but I think you are wise to read the reviews and see how people like them in the long run. My advice would be to also try the Simmons Beautyrest Platinum mattress in person and see if you like it as well. I think the Amberlyn Extra Frim might be a good option and it’s worth looking at those reviews and comparing them. Then, based on what retailer you go through, it might be worth seeing what the trial/return policy is on each mattress. Do you have some time to bring it home and try it? Lastly, I would also confirm what is included in the warranty for the beds. If it dampens with time or if there is an indent after the first year or two, does that qualify as a workmanship defect and will they handle it? Hope this helps – let me know if you have other questions! Addressing Pam of March 12,2017: These are serious health problems and merit a check up from a doctor and possibly sleep specialist. I think it is unrealistic and under-serving to suggest that all of these issues should first be addressed by a mattress choice. Study possible sleep apnea. Beyond that caution, I want to say that I share some of these problems and am being treated by a sleep specialist doctor. Still, these are my suggestions, not my doctors’: I would not choose a mattress with a “sink into” feeling. That makes it more effortful to roll or move. That means limiting thickness of memory foam and plush pillow-top. I recommend some level of Firm and to be selective. With some companies, for example, Luxury Firm is not as firm as Firm. Few people can tolerate the extreme end of the Firm spectrum. I recommend this author’s recommendations for “best mattresses for heavy people” if appropriate. 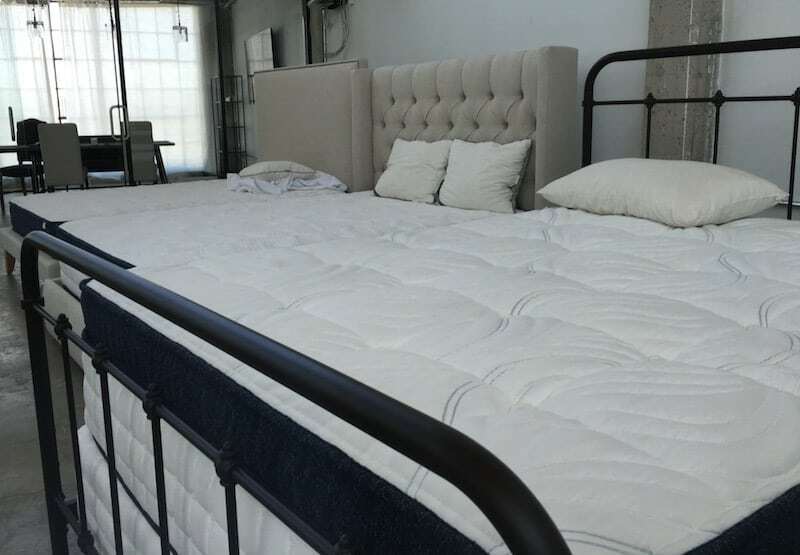 I have been looking at the “Original Mattress Factory” inner spring mattress and want to know how they rate compared to other mattress on the market. We had great results with our previous Double Pillow top mattress. Haven’t taken a look at them yet, but maybe I will in the future. Help please down to two mattresses. Winkbeds and Saatva, Full size 14.5″, medium firm, I am 71 sleep alone and sidesleep with some backsleep. The mattress will be on a full wood base with slats 3″ wide spaced 3″ apart and metal center rail with 3 support legs. $ not a factor. Warranty return policy maybe. Based on this can you help make the best decision for me. Hi Michael – a common question, not an easy answer! A lot of similarities with these two, I suggest reading through my Saatva vs WinkBeds post. Hi, I did tons of research and finally decided the Saatva extra firm king size bed was the best option. However, I have had it for two weeks and I can already see clear sunken impressions where my spouse and I sleep on the bed. Talked to Saatva (great customer service) and they said if it was more than 1 1/2 inches, then the mattress was defective. They said that impressions less than that are normal. Problem is, the current impressions look just like the 10 year old mattress I just got rid of. Saatva is perfectly willing to either refund money or send another mattress. Have you heard of others having a similar problem with this bed? I just think it is weird that there are permanent impressions after just a week or two. Tried the saatva luxury firm and don’t like the comfort top at all. Looking for very firm bed..is aviya a firmer choice or what else do u recommend? Was the only issue it wasn’t firm enough? In that case I’d recommend the Saatva firm. I’m stumped. I’ve had a winkbed for a month. I’m a side sleeper. I have been p8ning for a comfortable bed for years. Do not like memory foam. Not sure about latex. Bottom line – I can’t get comfortable. Working w pillows (including between legs). Lower back pain. Shoulders, arms, hand still go to sleep/go numb. Probably need to lose 30 lbs, but not sure what comes first – feeling refreshed to workout or work out to get a good night’s sleep. Always tired. Think I’m snoring sometimes, too (sore throat). I lay horizontal and diagonally across the bed, too. Any thoughts greatly welcomed. Hopefully in not writing in someone’s question or response? Thank you! Hi Pam – if you’re going numb on your shoulders/arms, you probably need a more contouring mattress. Either go for a softer version of WinkBeds (or add a topper), or try another brand. I’d figure out the snoring too, that’s a huge cause of fatigue! I have to agree that the WinkBeds is the ultimate comfort mattress. I used to be a fidgety sleeper, but turns out I was just sleeping on the wrong mattress. I got my WinkBed when the company first launched (maybe just under 2 years ago?) and I’ve been sleeping great ever since! No more tossing and turning for me! My winkbed is super comfortable. I tried a saatva before I got the winkbed and the difference in quality is very obvious. Hi Dottie – check out best mattress for heavy people post, let me know if you have questions on my recommendations there! Yes, after reading about all those new latex mattress’s they will mail in a box, the big factor not mentioned is weight. I’m pushing 200 lbs, 57 and the pain is getting worse most of the time. I sleep on the best mattress I have ever had, it’s a spring,, Serta I believe, but not the kind you have to or can turn over. I love it, want to keep it forever. My brothers are both pushing nearly 300….so those latex would not work for either of them. I have had a winkbed mattress for a few months now. It’s a great bed. I’m one of the few that is a back sleeper, I’ve tried many beds, but winkbeds has been my favorite thus far. After a LOT of research I chose a Powercore Nano 2 from Charles P. Rogers out of New York. Innerspring with cushy latex top. Best mattress I’ve EVER slept on and I’m 71. Free delivery to California. No tax. A FANTASTIC price. Better and less expensive than anything I could have bought locally. A comparable would have cost me at least $4,000. Highly recommend. I like your article. Looking to get a new bed. Sleeping on a 5 YOA Sterns & Foster – King GS Luxury Cushion Firm Euro Pillow-top, which has body impressions under 1 1/2″ on area where the wife and I sleep and a hump in center of bed, so warranty not covered for this. This mattress was a replacement for a 7 YOA King mattress with a hump in center of bed. I am interested to know your thoughts about King size mattresses which tend to have this “hump” in the middle after a few years of use. Is this common and if so why? How to avoid? Would you recommend a hybrid over a full foam for persons with back/shoulder/neck problems. And would yo recommend a pillow-top over a standard top? Hi Jim – this isn’t uncommon for pillow tops, just a lot of foam (that will eventually compress), so it will happen with every mattress over time. To avoid, you can try sleeping in different spots in the mattress (I know, sounds uncomfortable). Generally I think hybrid is best for support over the long haul (assuming high quality). I don’t generally recommend a pillow top, but some people really like that “sinking in” feeling. Thanks for the reply and info. So would you recommend the Saatva Luxury Firm or some other brand for my situation? Trying to decide on a mattress for my husband and I. We currently have an old inner spring mattress. I do suffer from some back pain and sciatica. My husband is about 240 and I am 150, in weight. We are both side/back sleepers. We would like to go up from a queen to a king size. I am leaning towards the Saatva luxury firm or the Loom & Leaf relaxed firm. I did try a beauty rest black in a store and that felt nice, but was crazy expensive. We have also slept on a foam mattress which was ok but I felt too warm. I would appreciate your thoughts or recommendations. I’m a side sleeper and husband sleeps on stomach and side. Returning the Beautyrest Black Mariela Plush because it is way too firm for me giving me all different pains even after more than 2 weeks. Looking at Beautyrest Platinum Gabriella Plush Pillowtop (14″ one). It felt nice and soft at the store. I’ve never had a pillowtop before and am concerned about the longevity of it. Any advice about pillowtops and this particular mattress? I also like the Black Katarina Plush pillowtop but I am scared to try another Black mattress. I have been following these reviews and comments. I am looking for (2) Twin Extra Long Beds to go on adjustable frames. To Replace a King. I am Retired/Disabled 56 y.o.a. With a large frame at 6′-2″ 275 lbs. I have severe spinal issues. Wife has medical issues as well. We both like a VERY FIRM mattress. We have been going crazy searching for months, Looking for the best one for us. We have ruled out many for various reasons. Presently, I am leaning towards the WinkBed. As I do like the idea of the Hybrid system. Our main concern is that we presently have a pillow which we cannot stand. This purchase was a total mistake. Previously I purchased a Memory Foam (when they had first came out) which I returned. Do you think the WinkBed will be to soft? We are also considering the Saatva “Firm” Bed . Can you advise? Or suggest another mattress that we may be missing that may work? Hi Steve – I do think that WinkBeds would be a good fit for you, though it may be a little soft for your taste. WinkBeds will make a firmer/softer version (at no extra cost) if you call in, I would suggest starting there. If not, Saatva Firm is probably best. I’ve had the Beautyrest Recharge Hybrid Firm for a month now. Like night & day compared to my 8-year old pillow top that came with a useless 10-year warranty. My advice would be to stay away from pillow/eurotop mattresses. Buy a plain top and add the memory/gel foam topper of your choice. It’s only a matter of time before pillowtops sag in the middle no matter how often you rotate them. I only weigh 125# and sleep on a full-size bed. I’ve put a 2″ memory foam topper that I had on a spare bed on top of my new mattress and sleep heaven! Although the plush version is recommended for side-sleepers, I find the firm top plus topper does the job and no hip divot or climbing uphill out of bed in the morning. What is your opinion on the Beautyrest recharge hybrid mattress ? I know the Saatva and Zenhaven are very different types of mattresses. Which one would you go with if you had severe mid and low back pain? Thank you! It really comes down to your preference, both can be a good solution for spinal alignment! Please review the Queen size Nest Bedding Alexander Hybrid mattress and compare/contrast it to the Queen size Winkbeds mattress especially (and also the equivalent Saatva mattress). My wife and I are side sleepers. Thanks much for your efforts and for your wonderful site!! Hi Richard – it’s coming up, keep an eye out!